Replace the api_client.html file with the one from the /api directory on your Convio website. Edit donation_flexible_sustaining.html reference to ConvioApi.js to point to the /api directory on your Convio website. 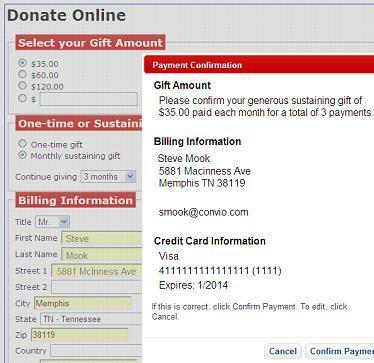 On your Convio website, create a donation form using the flexible sustaining template. Edit donation_flexible_sustaining.html to replace the values in the hidden inputs for form_id and level_id with the correct values for the donation form you created. Edit the line in donation_flexible_sustaining.html that instantiates ConvioApiClient to use the correct API Key for your Convio website and the correct path to api_client.html on the web server hosting this page. Note the form is only intended as an example of how to implement the donation API using AJAX. To adapt it for use in a web site, you will need to add success and error response handling code. Updated to fix UTF-16 (LE) encoding problem on HTML files.